Here is your chance to fly with the cute-mute hot air balloon. the only thing you have to do is go to Putrajaya on 18 March 2010 until 21 March 2010 (camping kat situ boleh tak ek?>_<). 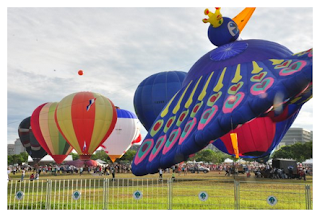 there are not only air hot balloons to rides, but lot more excitement is waiting for you! Jom Jom, pergi naik belon!